The cafe is open year-round, with al fresco dining available from late spring through early fall on our patio in Giddings Plaza. 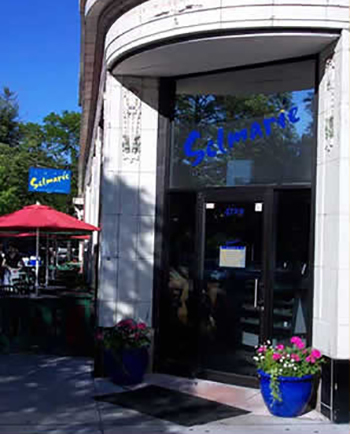 Cafe Selmarie is located in beautiful Lincoln Square, between Lawrence Avenue and Leland Avenue. We are adjacent to Giddings Plaza. Limited street parking is available on Lincoln Avenue in front of the cafe. City lot with pay boxes is located at Lincoln and Leland. We are less than a block away from the Western Brown Line CTA station. Easily accessible by Western and Lawrence buses. Gift certificates can be purchased in-store with cash or credit, or over the phone using a credit card. Gift certificates can be used for dine-in or bakery purchases. Café Selmarie accepts a limited number of dinner reservations and leaves the majority of seating open for walk-in guests. Patio seating is strictly first come, first served. Thank you! Copyright 2014 © Café Selmarie.